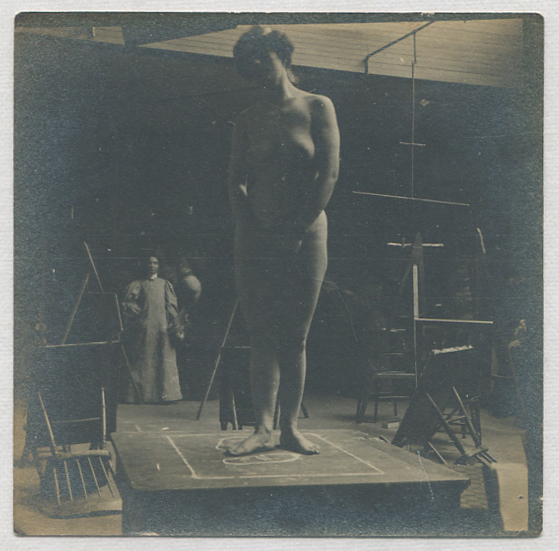 Based on this and many other similar photographs dating from the mid-1880s taken by Eakins or students in his circle in studios at the Pennsylvania Academy of the Fine Arts (PAFA) or the Art Students’ League of Philadelphia, one would think that our four photographs might have a similar provenance. However, when we asked Eakins scholar Kathleen A. Foster at the Philadelphia Museum of Art for help, she admitted, with a scholar’s delight, “Well, for starters, I have not seen anything quite like this—it doesn’t look like any photos I have seen of students in the PAFA studios, or the Art Students League in Philadelphia—the vertical board walls, with brick above—this is a space I do not recognize. Likewise, haven’t seen this set-up with the model on a table and the chairs used for easels.” She also noted the woman standing in the shadows behind Eve is wearing a “smock with big sleeves” which likely dates from the mid-1890s. 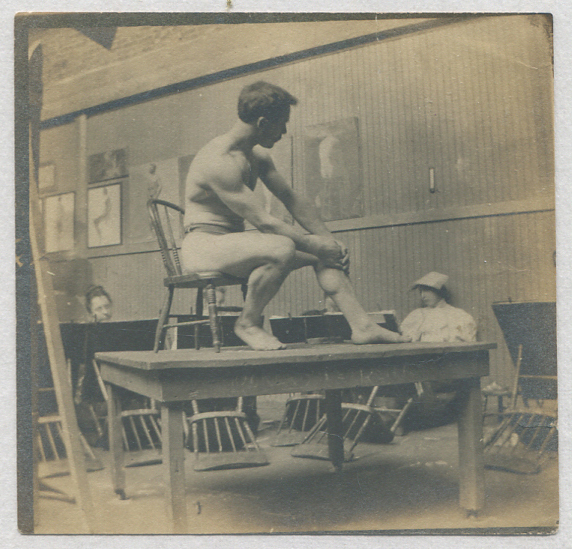 We know that Eakins also made photographic studies in the studio at his home on Mount Vernon Street, and in a studio at 1330 Chestnut Street that he shared with Samuel Murray. However, the few extant photos that we have seen taken in these two studios do not reveal enough of the interior background for us to make a positive identification. Our hunt, however, is nearly completed. We know why the photographs were taken; but the dramatis personae remain uncertain. Were they indeed taken by Eakins? Who is that seated man and standing woman? Where were they taken? With regard to the first question, the evidence points to Eakins. 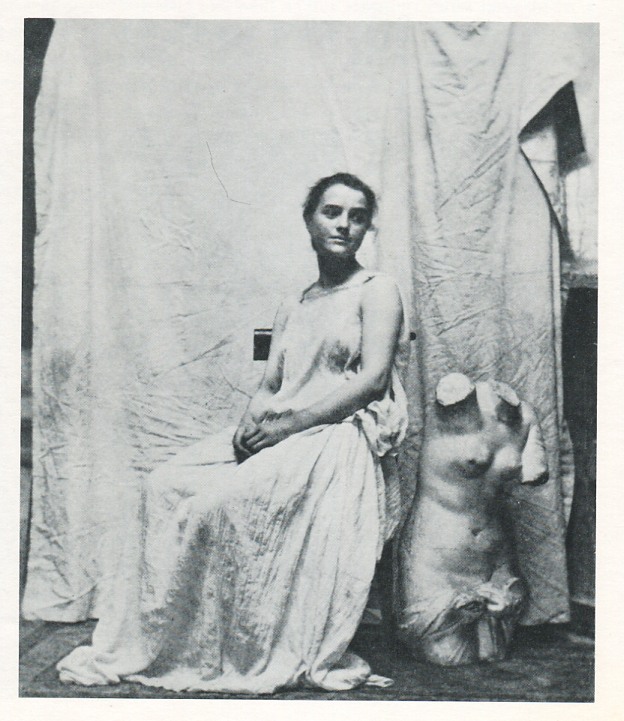 Gordon Hendricks, who organized the first exhibition of Eakins’ photographs at the PAFA in 1969, provides us with two relevant clues. 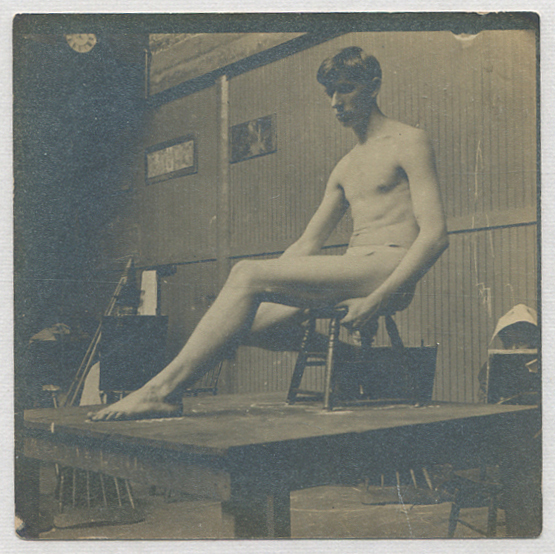 In the exhibition catalog he writes, “…how do we know the photographs in the exhibition are Eakins’? The answer is to be found in two areas: first, the provenance, and second, the quality and relevance. A number of the photographs were signed by the artist himself [most were not], and the overwhelming majority have come from his immediate family or from two pupils, Samuel Murray or Charles Bregler.” Our four photographs meet both conditions of quality and relevance, and the Samuel Murray provenance. It should also be noted that each photograph is signed “Lemly” on the back side in pencil. This was of particular interest to Kathleen Foster, “Also do not know “Lemly”—what a teaser!” It is unfortunate that the archives at the PAFA are currently closed to scholars, but we intend to further investigate the Lemly/Murray provenance with the PAFA’s archivist and the Samuel Murray scholar Michael W. Panhorst. We may even go to Washington to research the Murray material at the Hirshhorn Museum. The face of Eve in our photograph is hidden in shadow, but take a closer look at the dimple on her left arm at the elbow and compare that to Ms. Weda Cook’s dimple at the same spot. Dare we say the dimples at the elbow match?